It was meant to be the future of housing. 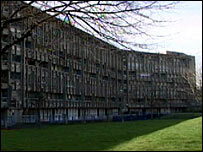 But nearly 36 years after it was built, the Robin Hood Gardens estate in Poplar, east London, is destined for demolition. For most of the current residents, the end of the concrete blocks cannot come soon enough. Yet for many well-known architects, the building represents a shining example of modern buildings and have signed up to an online petition in a bid to save it. Robin Hood Gardens was designed by architects Alison and Peter Smithson and finished 1972. The estate covers about two hectares and consists of two long blocks, one of 10 floors, the other of seven. It was described at the time as "streets in the sky" social housing. Mr Smithson said: "It is a model, it is an exemplar of a new mode of urbanisation." But the estate developed problems with crime and there were concerns with its quality and design. "People live in Robin Hood Gardens, like they live in a prison," said resident Charles Alison. "You could be walking along and all of a sudden you find something has hit you - an egg, a stone, a drink or cup thrown from the top." 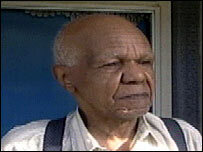 Fellow resident Obadiah Chambers said: "They should pull it down, without a doubt. "They would not be pulling my home down because I don't call it a home." Obadiah Chambers: "Robin Hood Gardens cannot be called a home"
On Wednesday night, Tower Hamlets Council agreed to demolish it and replace it with new homes as a part of regeneration of what is known as the Blackwall Reach area. During the consultation, more than 75% of residents said they would like to see Robin Hood Gardens knocked down and replaced. But a host of well known architects are fighting to save it. The Building Design website has begun a petition which it hopes to present to English Heritage to get the "seminal" building listed. The petitioners include Lord Rogers, Zaha Hadid and Stuart Lipton. Lord Rogers, who designed he Lloyd's of London building and the Millennium Dome, has written to the culture secretary Andy Burnham. In the letter he says: "Peter and Alison Smithson built two seminal buildings in London - the Economist Building in St James' Street and Robin Hood Gardens in Tower Hamlets - both as good, if not better, than any other modern building in Britain. "Whilst the Economist Building has been maintained and upgraded, Robin Hood Gardens has been appallingly neglected and, from the beginning, has been used as a sink estate to house those least capable of looking after themselves - much less their environment. "It would be a real tragedy and a terrible mistake to demolish this important and extraordinary piece of modern architecture."